When you have a new baby on the way, you have too much to think about that finding a good baby detergent is probably not the first thing on your mind. So, we did a lot of research to help you find the best baby detergent without having to worry too much. Before we get started, let’s look at the key things you need to know for how to pick the right baby detergent. Type: These detergents are available in liquids and powders. Neither one is better than the other but most people have a preference for which kind they prefer. Luckily, we found some really great options for both types. Organic: We didn’t find a lot of truly organic options. In fact, there are only 2 products on our list that are considered organic. That said, most of the others are completely plant-based and natural, they’re just not certified organic. Total Loads: The more loads you can get out a product, the better. When you have a new baby, you’re tired and forgetful and there are fewer things more annoying that finally getting to the laundry and realizing you’re out of detergent. Hypoallergenic: Any baby detergent for sensitive skin should be hypoallergenic, or free of added dyes, fragrances, and preservatives. Hypoallergenic products are less likely to cause irritation to sensitive skin because they have fewer things in them that can cause a reaction. Package Size: Some of these products are multi-packs that include 2 bottles of detergent rather than one. This can sometimes get you a really long-lasting supply for a better price. Just make sure you like it enough to use it for a while. Scent: Just to be clean, none of these products have any artificial fragrances or perfumes added. Most of them are, in fact, fragrance-free. That said the 3 that do have a scent use all-natural essential oils and botanicals. Now that you know a little bit more about what to look for, let’s get into our baby detergent review. Here’s how it works. We put our top and budget picks first so you’ll see them, even if you’re in a hurry. That’s the best way to see the range of products available. Stick around if you can, though, all of these products are perfect for baby and unique in their own way. Alright, let’s get to it. 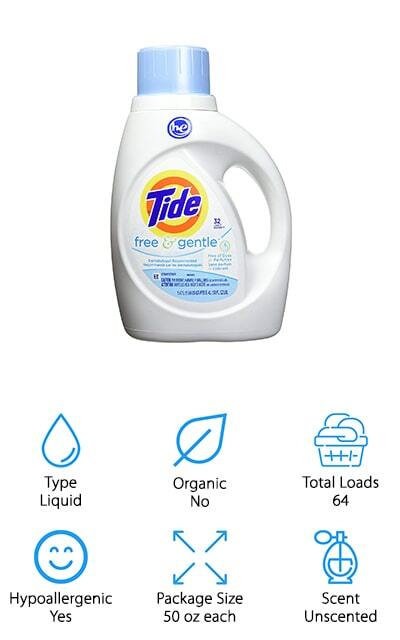 Our top pick is Tide Free & Gentle Laundry Detergent. While it’s not specifically labeled as a Tide baby detergent, it’s hypoallergenic and free of dyes and perfumes which makes it a great choice for your little one. Plus, it’s Tide, one of the best-known and most trusted brands out there. Not only is it safe for sensitive skin, but it’s also a powerful cleaner, removing more residue and stains than a lot of the leading free and clear detergents out there. This is a 2-pack, each bottle contains 50 ounces which means that it can clean 64 loads of laundry in all. While it’s true that laundry piles up pretty quickly with a little one, this will still last a pretty long time. Plus, it’s dermatologist recommended and formulated for high-efficiency machines. 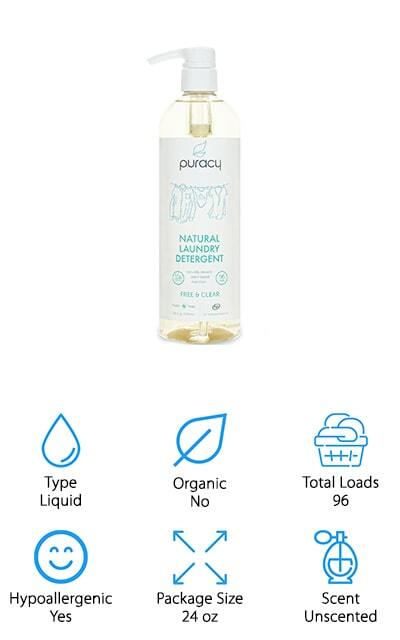 If you’re looking for a natural baby detergent, look no further than our budget pick, Puracy Natural Laundry Detergent. This industry leading formula uses 4 different plant enzymes to eliminate stains and dirt without dulling the material. You can use it on just about anything, including delicate fabrics, dark colors, cloth diapers, and more. It’s free of sulfates, bleach, and toxic chemicals which makes it perfect for your baby’s sensitive skin. The company is ethically responsible, too. They donate a portion of sales to local family and children’s charities and use local artists to provide the bottle artwork. It’s made in the USA and never tested on animals. This formula is very concentrated so this 24-ounce bottle can clean up to 96 total loads and it comes with a 100% satisfaction guarantee. 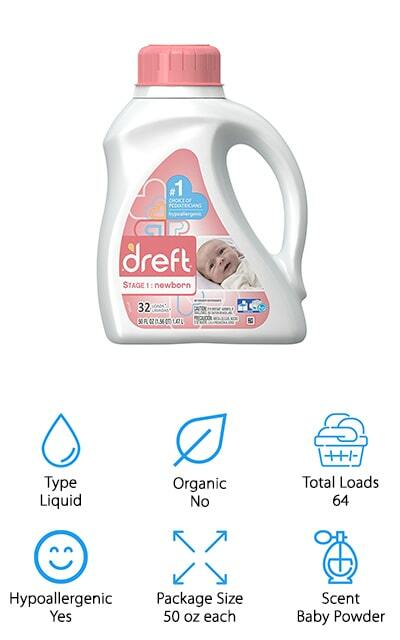 If you’ve read any Dreft baby detergent reviews, you know that it’s one of the most popular baby detergents out there. If you’ve looked at the Dreft baby detergent ingredients, you know why. Most of the ingredients are plant-based and the formula has been recommended by pediatricians and used by moms for more than 80 years. The Stage 1 Baby Detergent is specially formulated for newborns and is ideal for cleaning all their small, delicate clothes while being powerful enough to get big messes out of blankets, sheets, swaddles, burp cloths, and even cloth diapers. This product includes two 50-ounce bottles of high-efficiency detergent and washes as many as 64 loads. It has a baby powder scent that seems strong at first but quickly fades and leaves everything with a wonderful baby smell. 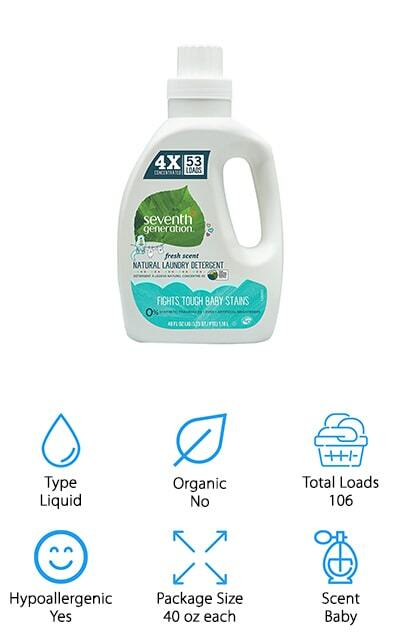 Another top rated baby detergent is Seventh Generation Laundry Detergent. This concentrated formula is tough on dirt while being gentle on your baby’s skin. It uses 95% USDA certified biobased ingredients for a safe, natural clean. If you’re weary of detergents that are scented, you don’t need to worry. Seventh Generation uses 100% essential oils and botanical extracts so all of their scents are completely natural. This quadruple enzyme formula cleans everything from breast milk and formula residue to messy cloth diapers. One thing to keep in mind is that this detergent is very concentrated so you don’t need to use a lot! In fact, a 40-ounce bottle cleans up to 53 loads and, since you get 2 bottles with this product, you’ll be prepared to get out tough stains for a long time. 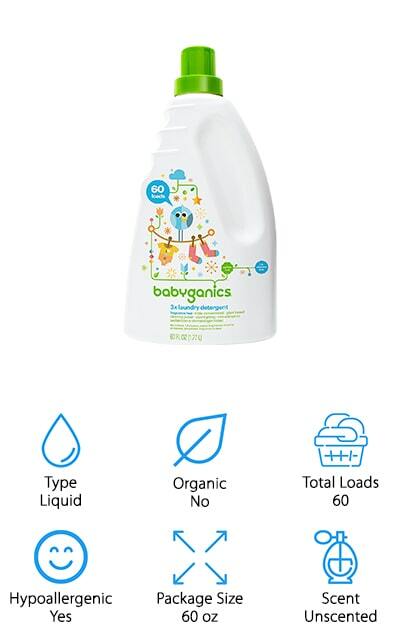 For a truly unscented baby detergent, check out Babyganics Laundry Detergent. It’s completely free of chlorine, phosphates, sulfates, and phthalates. It’s also clear and dye free and unscented so it won’t irritate your baby’s skin. It’s also a great choice if your little one developed sensitivities or eczema as they get older. So, now we know what’s not in it, let’s look at what is. It uses powerful plant-derived ingredients and enzymes. When it comes to detergent for babies, it’s important that it’s gentle but it’s easy to forget that some big messes will happen and you need something that can really get things clean. This is a great choice that effectively fights tough stains and is gentle enough for baby’s skin and delicate fabrics. It comes in a super-concentrated 60-ounce bottle that’s enough to wash up to 60 loads. You might not immediately think”baby detergent powder” when choosing laundry soap for your baby, but you should! Especially when it’s Molly’s Suds Original Laundry Detergent. We aren’t going to say that it’s a cheap baby detergent, but it’s reasonably priced and one 80.25 oz package washed 120 loads. It’s safe for every fabric except for leather and silk so you can clean just about everything with this powder including clothes, car seat inserts, bedding, and cloth diapers. That’s not all, if you have a really stubborn stain, this product also makes a great pre-treater. It’s made using only 5 pure, high-quality ingredients and is vegan, cruelty-free, and made in the USA. One more thing, it’s scented with peppermint oil and is the best smelling baby detergent around. 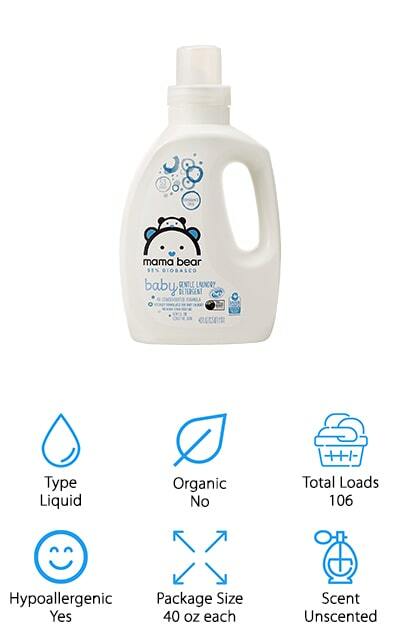 Another top baby detergent is this biobased option from Mama Bear. This formula is really concentrated and two 40-ounce bottles clean up to 106 loads. Don’t be surprised when you see how small the bottle is! You only need one dose of Mama Bear to equal 2 doses of other leading concentrated baby detergents. There’s more, it’s comprised of 95% USDA certified biobased ingredients and it’s free of phthalates, dyes, and fragrances so it’s super gentle on fabrics and baby’s delicate skin. The plant-derived enzymes and materials are tough on stains and dirt on clothes, cloth diapers, bedding, and burp cloths plus it’s effective in any water temperature. So, if you wash delicates in cold and heavily soiled messes in hot, this detergent works for it all. It’s a truly unscented detergent that you and your baby will love. 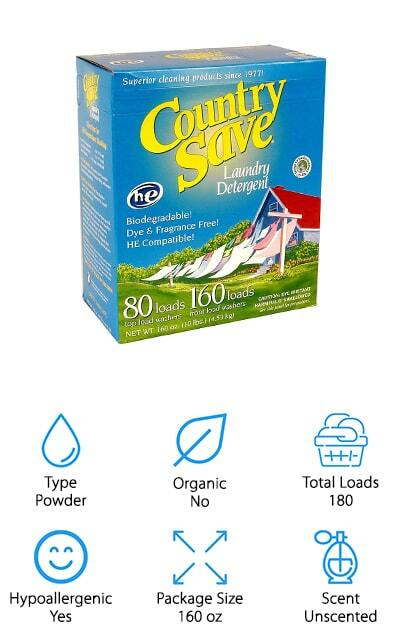 For the best baby detergent for newborns that’s a powder, we recommend Country Save Laundry Detergent. For one thing, it’s formulated to work equally as good in both hard and soft water so, whatever you have coming into your home, you’re covered. You can use it with both regular and high-efficiency machines, too. This is a really economical purchase. 160 oz of powder washes up to 180 loads in a high-efficiency machine. It’s safe for all types of fabrics and colors, brightens colors and gets whites truly clean. It’s even strong enough to handle messy cotton diapers. 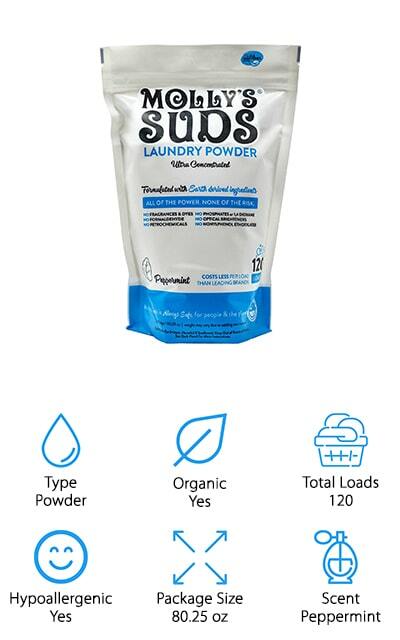 This low suds formula is unscented, dye-free, hypoallergenic, and made with earth-safe ingredients. In fact, it’s even EPA certified so if you’re looking for an environmentally friendly choice, this is a great one to try. Believe it or not, it’s not easy to find an organic baby detergent that’s both gentle and effective. 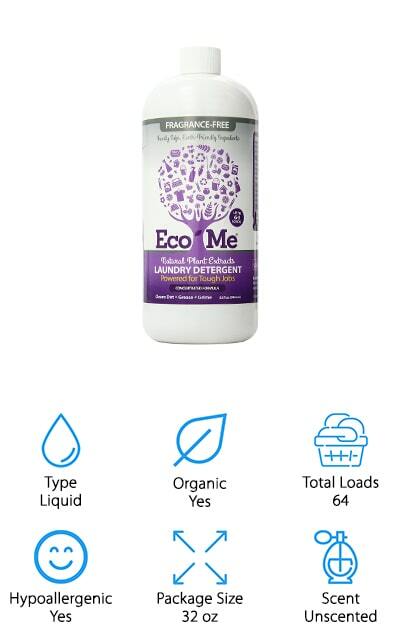 That’s why we had to include Eco-Me Laundry Natural Detergent on our list. This 2 times concentrated formula is tough on dirt and stains but uses only natural ingredients and botanicals so it’s also gentle on sensitive skin. It’s completely chemical free: no phosphates, chlorine, sulfates, dyes, or parabens. So, how does it work? It uses plant-based ingredients, enzymes, and essential oils to tackle dirt, stains, and odors. You can use it with both high-efficiency and standard washing machines, just use 1 to 2 capfuls for small loads and 2 to 3 for large ones. That’s not all, this product is made in the USA and never tested on animals and contains no animal by-products. 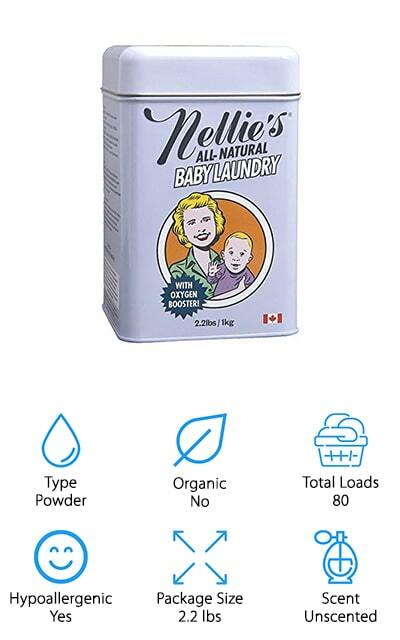 Last up is the best baby detergent for sensitive skin in powder form, Nellie’s All Natural Laundry Detergent. This non-allergenic, fragrance-free formula not only gets you little one’s clothes clean, but it also makes them whiter and brighter, too. It’s safe to use on just about anything including hard-to-clean messes like cloth diapers and burp cloths. The ingredients are derived from plant and mineral based ingredients that don’t leave behind any residue. All of Nellie’s products are in powder form because they don’t believe that shipping and selling water is fair to their customers or the environment. Why add water when the washing machine already does that? This powder is so concentrated that you only need to use about a tablespoon per load. That’s means you get more cleaning power in a smaller space.